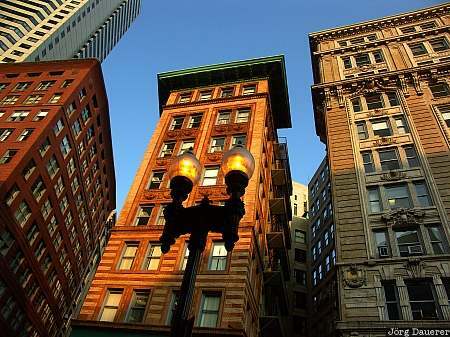 Street lamp and the facades of Boston illuminated by soft afternoon light near Downtown Crossing. Boston is in the east of Massachusetts on the east coast of the United States. This photo was taken in the evening of a sunny day in August 2004. This photo was the image of the month in February of 2019. This photo was taken with a digital camera.